Pyongyang, November 29 (KCNA) -- A fierce strife has recently kicked off among the conservatives of south Korea to secure the post of representative of the "Liberal Korea Party" ahead of its convention, which has become a target of public criticism. Former "Prime Minister" of south Korea Hwang Kyo An has buckled down to laying a stepping-stone toward the LKP hegemony, expressing his "full confidence to win the election at the convention." His growing impatience makes him call for joining LKP in a hurry and hosting a seminar, etc. Former LKP Representative Hong Jun Phyo, not to be outdone by his rivals, also said "it's time to restore the honor," declaring his "return to realistic politics." Kim Mu Song has betrayed his inner intent to seize the actual power in LKP. LKP Floor Leader Kim Song Thae is also going impudently, blustering that he would "challenge for party leadership for the sake of the conservatives and to win the next general election." He is busy speaking ill of his rivals in a bid to give a face-lift to his public image. Such disgusting low-browed politicians' paradox and jibe-trading only shed light on their intrinsic nature - scramble for seizing hegemony. They, being thirsty for power, don’t mind the people’s living. LKP is on threshold of collapse at the cesspool of history after being forsaken by the public who branded it as the "den of deep-rooted evils". 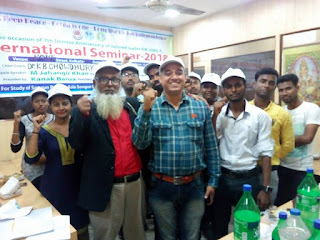 It is utterly ridiculous that the group of traitors who should be liquidated as early as possible is going to hold a convention, and it is just a tragicomedy that those traitors are scrambling for power of such party. All the "candidates" running for the LKP hegemony are just the worst criminals who threw the "state affairs" of south Korea into confusion and the people's living into misery by serving like a tool traitor Park Geun Hye who earned the ugliest fame in the political history of south Korea. Former "Prime Minister" Hwang Kyo An, who claims to be the first on the support list in the conservative camp, is just the fascist cutthroat that earned an ill fame for masterminding various high-profile plots like the spy case of a Seoul City public officer and the case of Ri Sok Gi-led rebellion, only to suppress pro-reunification democrats. Hong Jun Phyo, Kim Mu Song, Kim Pyong Jun and Kim Song Thae, well known as modern-version political chameleons, are all snobbish ones who have spent time idly in muddy corrupt politics, hell-bent on corruption and irregularities, confrontation with the fellow countrymen and sycophancy to big countries. It is quite natural that the power scramble in the group of traitors doing nothing good for the public but committing only sins is termed publicly a "philistines' dogfight for seizing party hegemony" and "farce of a stinking trash-like party." A leopard cannot hide its spots. The unpopular and treacherous nature of the conservatives and their intrinsic ill habit of backbiting one another can never change. On Nov. 21, the Paektu safeguard group was formed. It sent an open warning to the US and anti-reunification elements and started its activity. A new history is starting in 2018, however, the US is interfering in inter-Korean relations. Who is not witnessing the current situation of the Korean Peninsula? We issue a stern warning to the US. We will not allow any obstructive moves toward Korea’s reunification and don’t disturb peaceful efforts of the south and the north of Korea, the group strongly criticized the US at a news conference on the day. The Liberty Korea Party is hindering the process of requiring yes or no over the National Assembly ratification of the Panmunjeom and Pyongyang Declarations, it has turned its back on the peaceful reunification as it maintained its power under the pretext of the acute situation in the Korean Peninsula and the group would not tolerate the LKP’s vicious move in the future, it pointed out. The group read out a letter warning to the US and made scuffle with the police to convey the letter to the US embassy. The group declared that it would carry on actions against the hostile elements hampering the expected Seoul inter-Korean summit. Pyongyang, November 28 (KCNA) -- Japan rattles the international community with the "abduction issue". Of late Japanese Prime Minister Abe met with U.S. Vice-President Pence for cooperation in the "abduction issue". On the sidelines of his visit to Singapore for attendance of an international conference he met with heads of Southeast Asian countries for mendicancy. This is part of despicable moves for covering up the sexual slavery for the Imperial Japanese Army and other hideous crimes committed by the Japanese imperialists. As the DPRK has said in official statements, the "abduction issue" had already been settled by the DPRK's humanitarian measures. The falsehood of the non-existent issue has been brought in a bolder relief as the truth behind the unscientific "evidence" advertised by the Japanese authorities insulting the sincerity of the DPRK government has been brought to light from the outset and "victims of abduction" have been discovered one after another across the archipelago. The persistent anti-DPRK racket by the Abe group proves what the group seeks under the pretext of the "abduction issue". The international community has already branded Japan as a war criminal state against humanity. During the illegal occupation of Korea the Japanese imperialists pursued the barbarous policy of forced conscription and labor drafting, took more than 8.4 million young and middle-aged Korean people to battlefields and slave labor sites, drove 200 000 Korean women into sexual slavery for the Imperial Japanese Army and killed more than one million innocent Koreans. If Japan is truly interested in human rights, it should have called into question the unprecedented crimes against humanity and make reflection, apology and reparation. Japan still describes itself as a "victim" and claims that "the abduction issue is the first and liquidation of the past next". Japan is making desperate efforts to distort history for whitewashing the past crimes at home and to calm down the demand of the international community for an early reparation for the hideous crimes. Japan's oft-repeated "abduction issue" is nothing but the extension of the moves designed to direct world focus at the DPRK and hide the crimes. If Japan thinks that a mean trick can hide its past, it is mistaken. 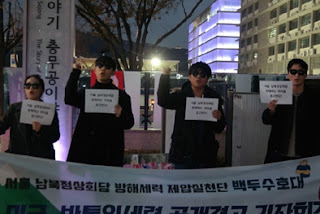 The typical example is that the "foundation for reconciliation and recovery", a product of plot of Japanese reactionaries to get rid of the issue of the sexual slavery in return for a petty amount of money, was dissolved in south Korea on November 21. The liquidation of the past is a legal and moral obligation for Japan before the Korean nation and mankind. A trick of Japan to bury in oblivion the history of aggression and plunder goes to fully show its illegal, immoral and shameless image before the international community. Pyongyang, November 28 (KCNA) -- The Abe authorities are suffering from unspeakable stress, being caught in contradiction in the international relations. Being left out of concern by the U.S. the relations with whom it put great trust in and whom it regarded as the eldest brother, Japan Prime Minister Abe reached the state of asking the U.S. president never to put the clock hand backward in relations between Japan and the U.S. He even tried to flatter the U.S. by taking the lead in building cooperation mechanism for pressurizing the DPRK, hardly catching any interest of its master. Though engaged in an array of diplomatic steps to access the DPRK with hope pinned on the DPRK-Japan summit in a bid to get rid of ever-worsening political isolation, Japan still raises rhetoric about sanctions and pressure and "abduction issue" in an effort to mislead the public. At the East-Asia Summit held in Singapore on November 15, Abe cited his intention to independently improve relations with the DPRK and sit knee to knee with the supreme leader of the DPRK for the establishment of diplomatic ties. Truly funny are the Japanese politicians with foolish intention on their minds as one can not but worry if they can get anything in return for peddling the worn-out rhetoric about sanctions and "abduction issue". Japan has fully disclosed its being to the international community, and the political caliber of the Japanese politicians has already come to an end. Japanese politicians should have sized up the change of strategic structure in Northeast Asia and the world and corresponding change of the world trend and have given double-thinking, if they truly wished for the better and prosperous future of the Japanese archipelago. However, outwardly touting the improvement of relations with the DPRK, a factor of massive influence on the world strategic balance, Japan, being keen on brown-nosing the U.S. and reading its face, has played the role of a robust pace-setter for its master pursuing hard- and soft-strategy with regard to the DPRK issue. When the U.S. included a DPRK-flagged trading vessel conducting normal trading transactions in a sanctions list of the United Nations in October, Japan, as if it had waited for it to happen, followed Washington's footsteps to include the vessel in its own sanctions list. As for the "abduction issue" touted by Abe as a precondition for the improvement of the DPRK-Japan relations, it is just a political farce serving the purpose of stirring up the awareness of stand-off with the DPRK timed to coincide with the U.S. massive anti-DPRK "human rights" campaign. The thoughtless act of Abe and his group against the DPRK, out of their senseless approach toward the ever-changing international political situation, is making Japan stand further isolated in the international community. An Egyptian newspaper said the abduction issue cited by Japan is an issue ignored by the U.S., further commenting that there are wide-spread diplomatic disputes between Japan and south Korea over the issue of reparation for the victims of forcible drafting and the issue of dominium over Tok Islets, and that today Japan's interests are things out of concern of its allies. Report of UK KFA Picket -No to BBC Lies About People's Korea ! The UK Korean Friendship Association (UK KFA) held the picket "No to BBC Lies About People's Korea ! " on the 24th of November from 1500 hours outside the BBC HQ , Broadcasting House , Portland Place , London . The picket was attended by members of the UK Korean Friendship Association , the Juche Idea Study Group of England , Association for the Study of Songun Politics UK , British Solidarity Committee for Peace and Reunification on the Korean Peninsula as well members of the New Communist Party , Revolutionary Communist Party of Britain ML and progressive members of the public. “impoverished”, “totalitarian “ and “ isolated “ . Rather than being impoverished the DPRK has a rapidly growing economy, it is a people-orientated society and rather than being isolated has diplomatic relations with over a 100 countries ! The UK Korean Friendship Association believes the BBC should stop lying about the DPRK and instead produce fair, accurate and objective material about People’s Korea !" Messages of support from Alejandro Cao De Benos President of KFA , from KFASUA , from Staffordshire KFA , From KFA Netherlands and a goodwill messages from UK KFA members were read out. Alejandro Cao De Benos in his message said " The US Imperialism, by utilizing its money resources and puppet mass media like the BBC, is regularly organizing campaigns of defamation and creating horror stories with the aim of creating fear and rejection to Korea among the general public. But the times of the U.S. and British media empires monopoly for mind control are coming to an end. The rise of popular and alternative low cost media and the suffering of the regular citizen is making more and more people to question every sensationalist news coming from the mainstream press. As more universities request us to hear about Korea directly from the source, as more and more fake news are being exposed, there is a new generation that will no longer swallow all nonsense and look to the source for information. That source is the KFA, and your help to approach Korea to the people will become more important everyday. We, the friends of Korea, armed with a thousand reasons and direct experience more than any rotten academician paid by the CIA, will expose the imperialist propaganda with facts and force the journalists to do their right impartial work, not to be merely slaves of the capitalist big brother losing their dignity on the way." ' Down with the BBC , Defend People's Korea ! Down with the lying BBC, Defend People's Korea !
' Down with the imperialist BBC , long live People's Korea ! Long live People's Korea , long live the Juche Idea ! Long live Marshal Kim Jong Un ! DPRK Flags and UK KFA banners were displaying along with placards denouncing the BBC . Regrettably this time , the BBC did not engage with us and merely sent their security men out to take a leaflet. A youth and students preparatory committee for welcoming Chairman Kim Jong Un’s visit to Seoul was formed on November 1 to start its work. 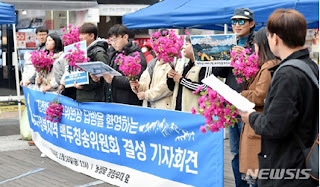 Thirteen groups including the Solidarity for People's Sovereignty and the Progressive Federation of University Students of south Korea called a press conference in Seoul on November 7 to declare the formation of committee for welcoming Chairman Kim Jong Un. 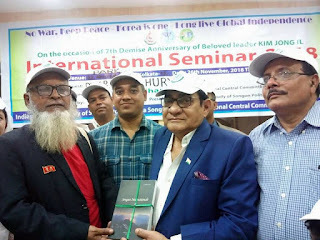 Those who have national conscience should welcome Chairman Kim Jong Un’s visit to Seoul, transcending all differences, Yun Han-tak co-chairman of the committee said and appealed to make Seoul and south Korea into a flower garden of peace and reunification through active preparation. 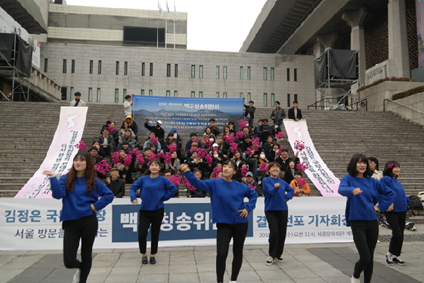 The co-representatives of the Progressive Federation of University Students of south Korea and the Youth Party called for the people to make Chairman Kim Jong Un’s historic visit to Seoul as an epochal event of independent reunification and that of historic significance. On Nov. 16, the Daegu and North Gyeongsang regional committees were formed under the sponsorship of the Daegu and North Gyeongsang Provincial Solidarity for People's Sovereignty. 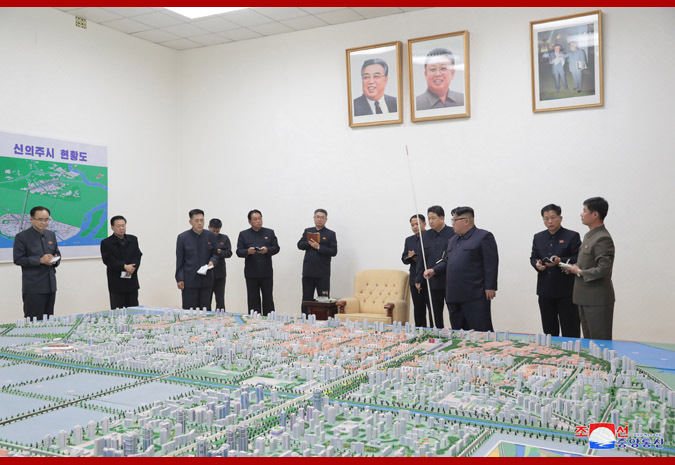 On Nov. 18, the members of the committees held a meeting for welcoming Chairman Kim Jong Un’s visit to Seoul as the Gwanghwamun Plaza in Seoul. The Seoul citizens welcome group launched its campaign welcoming Chairman Kim Jong Un’s visit to Seoul from Nov. 15. Now the south Korean people are looking forward his visit to Seoul. Twenty-two years have passed since Leader Kim Jong Il inspected the truce village of Panmunjeom. His historic inspection of Panmunjeom on November 24, 1996 encouraged the Korean nation distressed by national division with hope of reunification. On the day, he recollected great life and undying exploits of President Kim Il Sung who devoted his all to the country’s reunification until his last breath in front of the monument to President Kim Il Sung's signature. He defined the three principles of national reunification, the 10-point program for the great unity of the whole nation and the proposal for founding a Democratic Federal Republic of Koryo, set forth by the President as the three charters for national reunification. He hardened his fixed will to reunify the country for sure true to the President’s instruction for national reunification. The news rocked the Korean Peninsula and excited the Korean nation. It kindled the Korean nation, who was despondent over the country’s reunification after the demise of the President, to hope. Supreme Leader Kim Jong Un carries out the great cause of Leader Kim Jong Il for national reunification. He inspected the truce village of Panmunjeom in March 2012 to convince the people with his unwavering confidence in independent reunification. He looked round the monument to President Kim Il Sung's signature. Leader Kim Jong Il visited the truce village of Panmunjeom for four times and took measure to build the monument in Panmunjeom to convey long the last autograph of Kim Il Sung to posterity, he recollected with emotion. He made a firm determination to hand down a reunified country to the posterity by satisfying the lifelong desire of the preceding leaders. In his New Year Address for this year, he put forward the policy for great change in the north-south relations and good line for great turnand took bold steps in succession unprecedented in the history of inter-Korean relations. 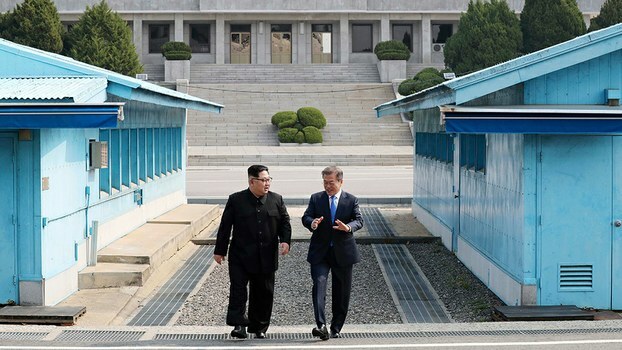 He made a fresh turn in realizing independent reunification with historic inter-Korean summit in Panmunjeom which led the adoption of the April 27 declaration. He, who brought about the spring of reconciliation in Panmunjeom, invited the south Korean President to Pyongyang and made the autumn of fecundity. The south Korean people and Koreans overseas highly eulogize Supreme Leader Kim Jong Un. They highly speak of him; “A broadminded and smart man”, “A great man with humility, frankness and composed manner” and “The savior of reunification and peace both in name and in reality”. Broad segments of south Korean people formed many organizations for welcoming Chairman Kim Jong Un’s visit to Seoul. The above-said facts are the eruption of public fervent reverence for the Supreme Leader and manifestation of opening of a new era of independent reunification led by the Supreme Leader. Led by the Supreme Leader, a peaceful, prosperous and reunified country would be built in the near future on the Korean Peninsula. Pyongyang, November 26 (KCNA) -- The U.S. is making a slushy farce even now when its hostile policy toward the DPRK called the "human rights in north" results in failure. Recently the U.S. let the Human Rights Watch, a plot-breeding organization, make public a groundless "report" that sexual abuses against women are prevailing in the DPRK. At the same time the U.S. is inciting an atmosphere of hostility toward the DPRK, making reckless remarks that the UN and the UN Human Rights Council have repeatedly suggested the human rights issue in north Korea, but the latter denied it as well as other international obligation. And it urged the north Korean leadership to make a responsible probe into the human rights abuses. U.S. Congress, conservative media and experts cry out for ceaselessly putting up the sanctions and pressure and "human rights issue" as a policy toward the DPRK. Worse more, the U.S. and its vassal forces recently fabricated again the "resolution on human rights in north Korea" at the United Nations Human Rights Commission. Rodong Sinmun on Monday says in a commentary that this is, indeed, the height of shameless and coward acts. The "human rights issue in north Korea" much touted by the U.S. is unrealistic and groundless sophism. All of them are based on the rubbish of the human scum who ran away after committing unpardonable crimes before the country and people and turning their back upon their parents and children. It is abnormal to make the "testimony" cooked up by the human scum who do everything for a petty amount of money sound plausible. The U.S. groundless farce is aimed to tarnish the image of the DPRK, justify its sanctions and pressure upon the DPRK, secure concessions from it at the DPRK-U.S. negotiations and furthermore, realize the sinister scheme to bring down the DPRK's social system. The U.S. should properly understand the strategic position of the DPRK and face up to the changed trend of the times and behave with decorum, not to take issue with others for no reason. This is the way out to escape gloomy future. 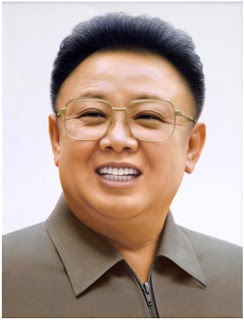 On the 17th of December this year it will be 7 years since the great leader comrade KIM JONG IL passed away unexpectedly whilst giving on the spot-guidance . He is remembered for his work in developing the Juche idea in depth and systematizing it as well as energetically conducting Songun politics and guiding the revolutionary armed forces of People's Korea . Under his leadership the Juche revolutionary cause , which was started by the great leader comrade KIM IL SUNG , was carried forward with vigour . Under the leadership of comrade KIM JONG IL the DPRK was turned into a nuclear power . It has been reported in the media that two vessels from the south Korean navy , the Destroyer Chung mu Gong Yi Sun Shin and the supply ship Dae Cheong are visiting Portsmouth , the home of the Royal Navy and are being hosted by the Royal Navy . This is at a time when the British navy has vessels in Korean waters participating in the enforcement of sanctions against the Democratic People's Republic of Korea. It is not conducive to the mood of peace on the Korean peninsula for south Korean warships to visit other countries not conduct exercises for the enforcement of sanctions against the DPRK , the dialogue partner of south Korea. South Korea should not depend on other countries but should follow the road of independence. The British government and British naval authorities should not encourage or abet the south Korean military in anti-peace , anti DPRK moves. The south Korean military staged such war drills as the "anti-infiltration drill 2018" and Hoguk and decided to introduce an air tanker from abroad and purchase ground-to-air interceptor missile. Such moves conflict with the letter and spirit of the Panmunjom declaration and violate the "September Pyongyang Joint Declaration". These actions of the south Korean military authorities are seriously undermining moves towards peace and reunification on the Korean peninsula as well as being a betrayal of the Korean nation. We totally condemn the south Korean military authorities for holding such exercises . 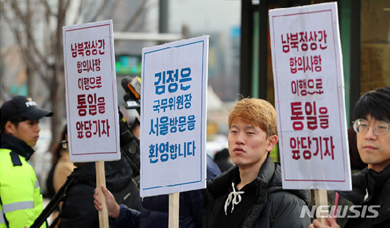 On Nov. 10, a rally of workers took place under the sponsorship of the Korean Confederation of Trade Unions in Seoul. 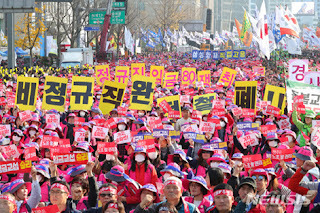 About 60 000 workers from across south Korea took part in the rally to renew their victory in the general strike. Retrogressive labor policy by family-controlled conglomerates and business groups, defunct labor commitment and stationary old legacies: expectation of the government is changing into disappointment and despair, the KCTU deplored. It would transform the south Korean society in the spirit of the candlelight resistance and it is a sound succession to spirit of Chun Tae-il in 1970, it noted. 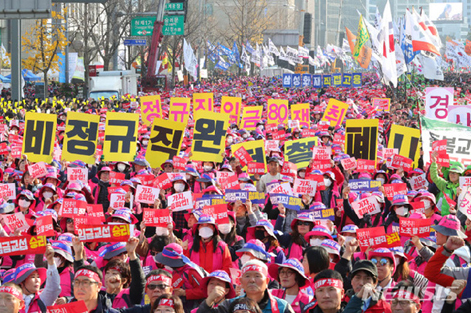 Prior to the rally, eleven trade unions including the Metal Workers Trade Union and the Mart Trade Unions held meetings outside the Cheongwadae and Seoul. At the rally the KCTU declared a joint action against 1.1 million part-timers from Nov. 12 to 16 and planned to open mass rally on Dec. 1 in Seoul. A/C.3/73/L.40 on human rights in the Democratic People's Republic which had been sponsored by the European Union(EU) and Japan amongst other countries. We would like to make the following points;. Firstly , the resolution is not based on any actual real factual evidence .It contains a number of entirely fictitious statements and is based on fabricated evidence from a very small number of so-called "defectors " from People's Korea who betrayed their socialist homeland for money and will tell any lie just to have dollars in their pockets . The UN has never bothered to speak to the millions of people living happily in the DPRK . Thus the UN is in more ways than one representing the few against the many. Secondly , there is no human rights issue in People's Korea . The right to work , the right to education , the right to housing , the right to medical care and the right to social security are all guaranteed. Women hold equal rights with men . So there is no need for the UN to trouble itself with the non-existent "human rights " problem in the DPRK. Thirdly , the resolution is a a grave infringement of the DPRK 's sovereignty and independence.. It is also a regime change resolution aiming at the overthrowing the people-centred socialist system(which is the cradle of happiness and bliss for the Korean people) of People's Korea . The EU and Japan which were the main sponsors of the resolution are both big violators of human rights . Japan is well know for discrimination and ill-treatment of racial minorities particularly ethnic Koreans and was guilty of the crime of sexual slavery . The EU is riven with poverty and racism .Also neo-nazi-ism is a force in many EU countries . The US which was another sponsor of the resolution has many unemployed and homeless. Also amongst the sponsors of the resolution was Zionist Israel and fascist Ukraine . They need to put their own house in order before they criticise other countries . We totally denounce and condemn the UN resolution and call for all truth loving people to reject the anti-DPRK "human rights campaign ". Stop all anti-DPRK human rights campaign ! 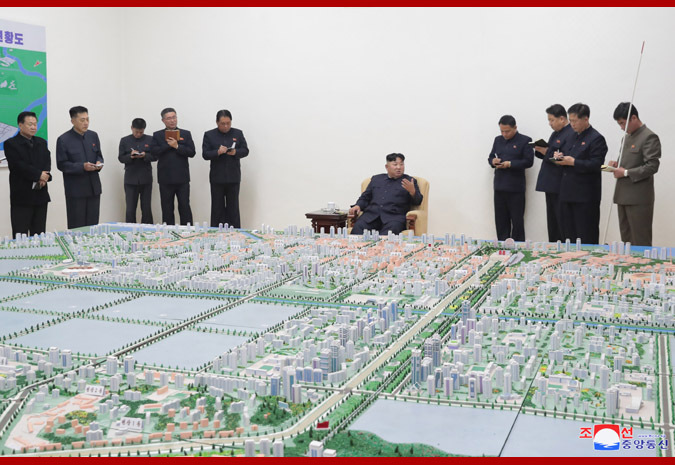 Pyongyang, November 20 (KCNA) -- A saying goes habit is a second nature. The group of the "Liberal Korea Party" on the verge of collapse is keen on "mega-merging of the conservatives". "National Assemblymen" from the traitorous party and coteries of its emergency measure committee, calling the present moment an "essential point for reorganizing conservative non-government camp," keep shouting hoarse for "rebuilding a bipartisan system structure" and "setting up anti-Moon Jae In solidarity". Making eyes at the "Parun Mirae Party" on one hand, they are complimenting former "prime minister" Hwang Kyo An as "an asset of conservatives," being deeply engrossed in a persuasion campaign for "enrollment in the party". The merging farce of the conservatives that aims at seizing power is not just simple reorganization of the political camp but an outright challenge and an open declaration of a war against the south Koreans who overturned the conservative regime through righteous candlelight resistance. The candlelight vigil that brightened the land across south Korea was an eruption of the pent-up wrath and indignation of the south Koreans against the fascist dictator ill-famed for unpopular rule, sycophantic treachery and confrontation between the fellow countrymen. But the accomplices who should have already been punished together with the kingpin of dictatorship, corruption and irregularities are whetting the sword of revenge. They spit out invectives almost every day, calling on "conservatives to rally to end the leftist regime" and pledging to "punish the leftist regime to satisfy the grudge of the conservatives". To rake up the conservative forces, they held the farce of admitting thousands of the "Thaegukgi Unit" into the "Liberal Korea Party," a group of ultra-right conservatives who took up the cudgels against the impeachment of traitor Park Geun Hye. Chosun Ilbo, Dong-A Ilbo and other conservative media have been exploited to describe the candlelight actions waged by the broad segments of south Koreans as a "riot egged on by the pro-north leftist forces". Clear is the aim sought by the group of the political philistines in crying out for the "mega-merging of conservatives," still going in high spirits, though they are forsaken by the people for their thrice-cursed crimes. That is to annihilate the democratic reformist forces as "pro-north leftist forces" and "leftist regime" and to go back to the era of nightmare-like conservative regimes. This shows with added clarity that the merging farce is part of a political coup for the revival of fascist dictatorship. 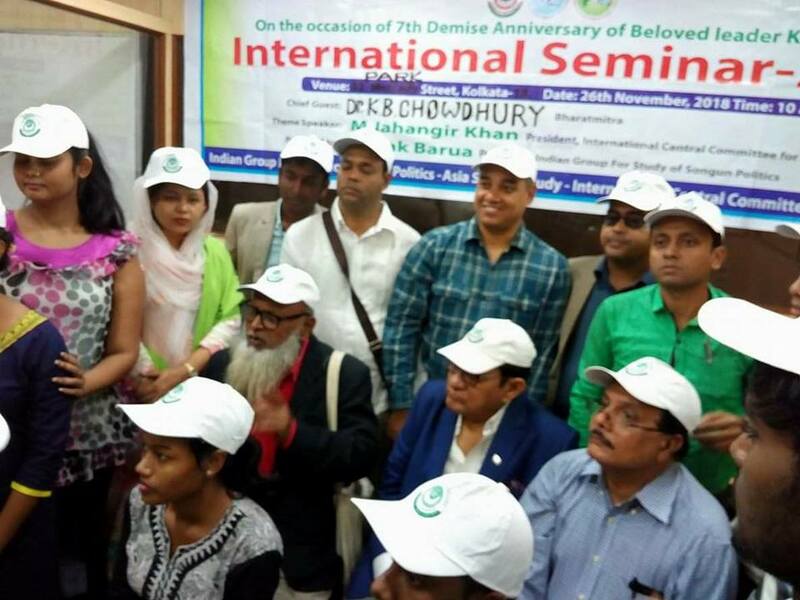 Nothing can reverse the public inclination toward social justice, democracy, and independent reunification of the nation however desperate the sediments of history may try. The UK Korean Friendship Association (UK KFA) takes issue with the connivance of the British government with the anti-DPRK sanctions of the US and UNSC. Yesterday the UK Foreign and Commonwealth Office (FCO) issued a statement after a meeting with officials from the US State Department. It unjustly branded the DPRK's legitimate trading activities as "illicit" and even called on the maritime industry including insurers "to ensure they are taking all steps possible to cease any activities that may contribute to the DPRK’s ability to import refined petroleum, and export coal and other sanctioned items". It is especially noteworthy that the government are trying to rope in private companies into enforcing sanctions against the DPRK. This represents a move to further extend the sanctions against People's Korea; it is totally unjust and reactionary measure. The sanctions on the DPRK by the US and the UN Security Council were wrong right from the very start as they sought to punish the DPRK for self-defensive activities which are allowed under the UN charter. Moreover the permanent members of the UN Security Council have themselves carried out nuclear and ballistic missile tests; therefore the sanctions against the DPRK are hypocritical ones. The DPRK has suspended nuclear and missile tests so there is now absolutely no reason for the sanctions to continue to remain in force let alone being stepped up and intensified. The DPRK has made moves towards peace this year such as holding the June 12th summit with the US president and holding three inter-Korean summits. This also negates any reason for sanctions against the DPRK. Indeed because sanctions are basically economic warfare, they could impede and imperil the peace process on the Korean peninsula. 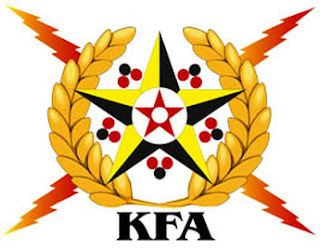 The UK-KFA calls upon the British government to abandon its attempts to sabotage the momentum towards a regional rapprochement. Instead the UK should adopt a positive outlook to the DPRK; a mutually beneficial policy of constructive engagement and trade. Pyongyang, November 17 (KCNA) -- The Permanent Mission of the Democratic People's Republic of Korea (DPRK) to the United Nations issued the following press statement with regard to the forced adoption of the anti-DPRK "draft resolution on human rights" submitted by the European Union (EU) and Japan at the Third Committee of the 73rd Session of the United Nations General Assembly on 15 November 2018. The Permanent Mission of the DPRK to the UN resolutely and totally rejects the anti-DPRK "resolution" (A/C.3/73/L.40) which was adopted forcibly at the Third Committee of the 73rd Session of the United Nations General Assembly. 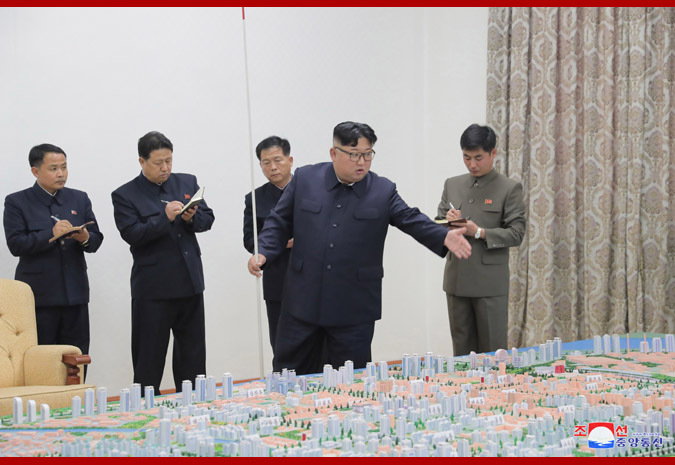 The "resolution" has nothing to do with genuine human rights, as it is a product of political plot of hostile forces that try to disgrace the image of the DPRK and overthrow its social system. "Human rights issue" mentioned in the "resolution" has never existed and cannot be allowed to exist in my country where we value most the dignity and independent rights of human being. All materials contained in the "resolution" are nothing but the most despicable false words fabricated by a handful of "defectors" who escaped after having committed crimes to sustain their dirty lives and therefore, we don't feel any need to make even a word on it. My delegation expresses deep concern and surprise at the fact that EU and Japan instigate confrontation by tabling "draft resolution" which is full of political criticisms and fabrication, at the time when the atmosphere of reconciliation and cooperation is prevailing on the Korean peninsula and efforts are being made for establishing a permanent and durable peace mechanism in the Korean peninsula. The main sponsors of the "draft resolution", EU and Japan are neither qualified nor in a position to talk about other's human rights issues. In those countries of the EU, the grave crimes against humanity continue to be perpetrated like Islamophobia, xenophobia, extreme racial discrimination and ill-treatment, worst-ever refugee crisis and neo-Nazism. Especially Japan is the criminal state which militarily occupied Korea in the past and committed A-class crimes against humanity such as 1 million massacre, 8.4 million forced drafting and 200,000 sexual slavery for the Japanese army. But not yet Japan implemented at all the recommendations of the UN Special Rapporteur on violence against women, Ms. Radhika Coomaraswamy, officially made in 1996 to the Japanese government for acknowledgement of the Japanese military sexual slavery crime, official apology and compensation to the victims, full disclosure of relevant document and materials, set up of special administrative tribunal and punishment of the perpetrators. Japan must implement these recommendations of the UN Special Rapporteur on violence against women at the first, before talking about other's human rights issues. The United Nations should, first of all, take issue with the crimes of human rights violation of these countries strictly and punish the perpetrators completely. Today, in the DPRK all people are enjoying genuine freedom and rights to the full extent thanks to the politics of attaching importance to, respecting and loving the people unfolded by Chairman Kim Jong Un of the State Affairs Commission of the Democratic People's Republic of Korea. We take great pride and confidence in our style socialism and the system of providing true human rights chosen with conviction and consolidated and developed by ourselves. The test of the new advanced tactical weapon of People's Korea that was conducted under the guidance of the dear respected leader Marshal KIM JONG UN , is very great news . It is an assertion of the DPRK 's independence and shows that it has not been fooled or deceived by the tricky and cunning US imperialists and their false ballad of 'peace ' . The weapons test is a great blow against imperialism and will strengthen the DPRK 's Juche-based independent defence capabilities . Those who said that the DPRK was selling out have been proved wrong ! Long live respected Marshal KIM JONG UN ! So the UN have passed yet another fake , reactionary human rights resolution against People 's Korea . This is not based on any real , hard , tangible evidence but on fabricated stories from so-called "defectors " who betrayed their Juche country and sold out for 800k dollars so will say anything they are told . Really those countries who backed the resolution have no right to cast stones at People's Korea . Lets look at them , Japan is well known as a war criminal state and for endemic racism against ethnic minorities including Koreans in Japan . Japan has been shown to ill treat old people . Then you have the United States , a country of extreme inequality , a land where money buys everything . The US has thousands of homeless people .It has people begging on the streets and living in tents . The US is a land of racism with dozens of fascist and neo-nazi organisations who are unimpeded by law . Then you have south Korea which still has the National Security Law and still jails communists and Juche idea followers , South Korea has the longest working hours in the world and is known as the 'republic of suicide ' . Finally there is the EU one of the prime movers behind the resolution . This is an institution hated and rejected by the peoples of its member states who cannot wait to leave it ! All member states of the EU have high unemployment , poverty and homelessness.Far right fascist groups stomp the streets of EU member countries such Germany with its history of nazi-ism . Britain which is still an EU member state and has been active in slandering the DPRK's human rights record , has growing legions of homeless and people queuing up at Foodbanks ! Ever since the DPRK went through a difficult period in the 1990s due to extensive flooding , hailstorms plus the disappearance of the world socialist market and the intensification of sanctions and blockade against the DPRK (the DPRK faced a double and triple blockade as some trading partners demanded payment in dollars ) . These circumstances were used by the imperialists and other enemies of Juche to malignantly slander the socialist system .The reptile press talked about "famine " and "starvation" etc. JISGE sent a delegation to the DPRK in 1996 and saw no signs of famine or starvation. We were castigated and criticised for telling the truth. KIM IL SUNG pointed out in 1962 that " Comrades, formerly we had to buy grain from foreign countries every year. But, from this year on we need not do so because we had a good crop last year. What a good thing it is to harvest a good crop and lighten the burdens of our brother countries!". Our delegation can remember visiting the Sunan Farm in 1996 and being told that 8 tons of grain per hectare were harvested and also seeing giant apples. The DPRK was actually a grain exporting country . I remember a bourgeois reference book in a library in the 1980s showed that the DPRK was a major rice exporting in the 1970s .Checking the index mundi, an imperialist reference source that is by no stretch of imagination pro DPRK or pro Juche or pro communist , I found the following facts , in 1977 the DPRK exported 412,000 tons of milled rice along with 200,000 tons of corn . In 1975 and 1976 it exported a record 300,000 tons of corn . The DPRK exported 10,000 tons of milled rice in 1990 and 12,000 tons of corn. So it it is nonsense to say that the DPRK cannot "feed itself " etc and dissmiss Juche socialist agriculture and self-reliance ! Pyongyang, November 16 (KCNA) -- Films dealing with the sexual slavery for the Imperial Japanese Army hit the silver screen at an international film festival in Washington D.C. The first film festival squarely dealing with the sexual slavery has the theme "wartime sexual abuses, unhealed wounds." Seeing this, the international community realizes that the settlement of the sexual slavery issue still pending in the crime-woven history of Japan has become a serious question, the solution of which brooks no further delay. The sexual slavery is the heinous inhuman crime which was perpetrated by the Japanese imperialists with the direct involvement of their government. Many Asian women including 200 000 Korean women were raped, gang-raped and massacred by the Japanese imperialists in an organized way. Yet, today's Japan fails to make an apology and reparation for it, still going with impunity. Far from making an apology for the hideous past crimes and reflecting on them, the Japanese reactionaries are behaving so impudently, only to stun the public. Worse still, they are working hard to cover up the information related to the sexual slavery. Principal criminals involved in the establishment and operation of the sexual slavery system keep mum, not confessing their crimes. A lot of classified documents detailing the sexual slavery run by the military are kept in the Ministry of Defense, Police Agency, Ministry of Health, Labor and Welfare and Ministry of Finance of Japan. The ruling quarters of Japan are disallowing the description of the fact in the history textbooks while refusing to declassify the documents. The Abe regime is talking rubbish that there is no information proving the Japanese army's forcible drafting of comfort women, and even terms the sexual slavery "volunteer service for making money." However, the crime-woven history can be neither written off nor covered up. A footage proving the heinous massacre of Korean women by the Japanese imperialists kept in the U.S. National Archives was opened to public recently. And operational records of the allied forces dealing with the gun-killings of the 30 Korean women dating September 13, 1944 were declassified. This being a hard fact, Japan desperately moves to push under the carpet the sexual slavery crime and evade the international responsibility for it only to betray its moral vulgarity. Japan should honestly apologize and atone for the sexual slavery, instead of disregarding the demand of the international community for the settlement of the sexual slavery issue. Pyongyang, November 16 (KCNA) -- Japan's military moves are so noisy in the region recently. It recently conducted an interceptor missile test in league with the U.S. in the waters off Hawaii. In October the Ground "Self-Defense Force" staged its first joint drill with the UK army. It was reported that it is the first time for it to conduct a joint military drill with a foreign army on the mainland, except the U.S. army. GSDF staged the first joint drill with the Indian army in a northeastern area of India. 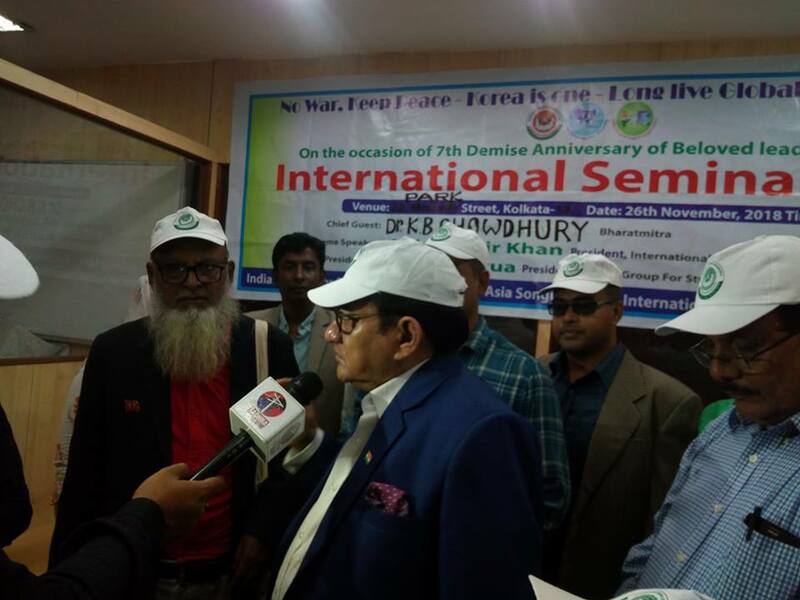 As known, unprecedentedly getting stronger in the region is the joint effort for defusing the danger of war and preserving peace and security. However, Japan is keen on disturbing the regional situation, failing to take part in the brisk regional dialogue but getting more and more isolated. Worse still, the militarist fanatics of Japan are getting desperate in the reckless military moves for realizing the wild ambition for overseas expansion, only to go against the trend of the times and the public aspiration. This can never be overlooked. The Abe regime decided to extend the sphere of SDF overseas dispatch to Asia this year although it was confined to Africa under the signboard of UN peace-keeping activities. It established a mission in NATO and is putting efforts in intensifying "cooperation" with its member states. The overseas advance of SDF being expanded to across the world means that Japan's military operation covers the whole world. This also can be abused to secure a "pretext" for the Japanese forces to be involved in a war of aggression in any part of the world as was in the past century. It is as clear as noonday that the Japanese reactionaries are seeking to realize their dirty dream at any cost by perfecting the actual fighting capacity of SDF under the pretext of "military cooperation" and "joint drill." With no sleight of hand the militarist fanatics can ever hide their wild ambition. The international community is seriously concerned of the Japanese reactionaries' bellicose moves destroying peace in the region and other parts of the world. 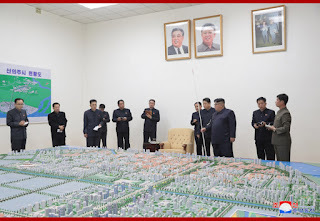 Pyongyang, November 16 (KCNA) -- Kim Jong Un, chairman of the Workers' Party of Korea, chairman of the State Affairs Commission of the Democratic People's Republic of Korea and supreme commander of the Korean People's Army, examined and guided the master plan for Sinuiju City together with leading officials of the party, administration and design organs of North Phyongan Province. Kim Il Sung and Chairman Kim Jong Il gave instructions dozens of times is a very important task of carrying out their behests, he stressed the need to gain good fruition within a few years to come. 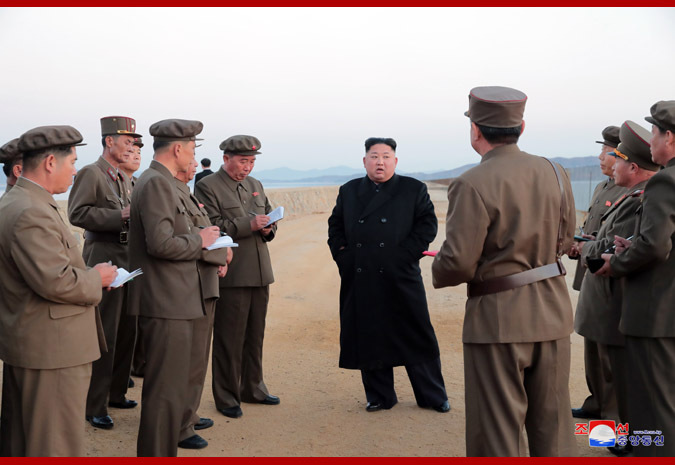 Pyongyang, November 16 (KCNA) -- Kim Jong Un, chairman of the Workers' Party of Korea, chairman of the State Affairs Commission of the Democratic People's Republic of Korea and supreme commander of the Korean People's Army, visited the test ground of the Academy of Defence Science and supervised a newly developed ultramodern tactical weapon test. After seeing the power of the tactical weapon, Supreme Leader Kim Jong Un was so excited to say that another great work was done by the defence scientists and munitions industrial workers to increase the defence capability of the country and the weapon system whose development Chairman Kim Jong Il had chosen personally and directed step by step with his special attention paid to it was born at last. He added that the weapon is just like a posthumous weapon and he missed Kim Jong Il very much while seeing the great success of its test. 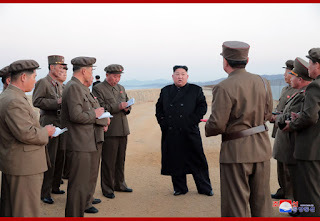 Kim Jong Un highly praised the officials, scientists, technicians and munitions industrial workers for successfully conducting the test of an ultramodern tactical weapon, to which the Party has attached importance in ardent expectation. He expressed great satisfaction, saying the great success serves as another striking demonstration of the validity of the Party policy of prioritizing defence science and technology and the rapidly developing defence capability of the country and as a decisive turn in bolstering the fighting capacity of the Korean People's Army. 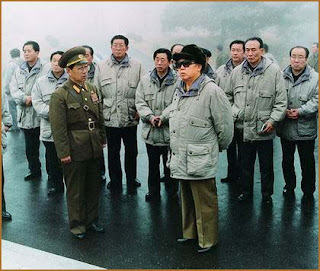 22 years ago on the 24th of November the great leader comrade KIM JONG IL,eternal general secretary of the Workers's Party of Korea visited Panmunjom on the at a time when the US imperialists and world reactionaries were running wild to stifle Juche Korea the fortress of world socialism. 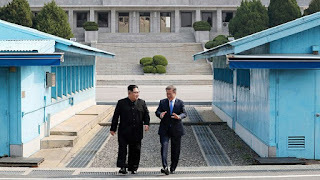 Moreover the visit of the great leader comrade KIM JONG IL to Panmunjom where the DPRK and US stand in confrontation with one another,basically the front-line between imperialism and socialism in the world shook the US imperialists rigid with fear. Panmunjom is a place that symbolises the tragic division of Korea's by the US imperialists and great powers, it is also the place where the US imperialists acknowledged their defeat in the Korean war by signing at the armistice agreement on the 27th of July 1953.It was known as one of the most dangerous flash points in the world as it is here where socialism and imperialism confront each other with arms. For the great leader comrade KIM JONG IL to visit Panmunjom was a courageous thing to do as the guns of the imperialists and puppets would be trained on him. However he had no fear of the enemy, moreover he demonstrated his desire which is also the desire of the entire Korean people north and south to end the division of Korea forthwith. 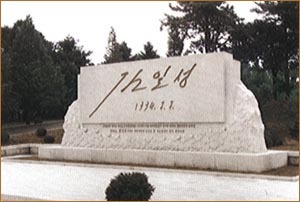 He visited the monument to the autograph of the great leader President KIM IL SUNG, this was the signature on a document for the peaceful reunification of Korea. The visit of the great leader eternal chairman KIM JONG IL to Panmunjom was symbolic of his will and intention to reunify Korea without delay. Now the work of great generalissimo KIM JONG IL and his policies for national reunification are being carried forward splendidly by dear respected Marshal KIM JONG UN . Respected Marshal KIM JONG UN is realising the will and intention of chairman KIM JONG IL to reunify Korea without delay .Respected Marshal KIM JONG UN has not only visited Panmunjom several times but made into a place to realise the dream of the entire Korean people for reunification by holding two inter-Korean summits at Panmunjom ! .US OUT OF KOREA !